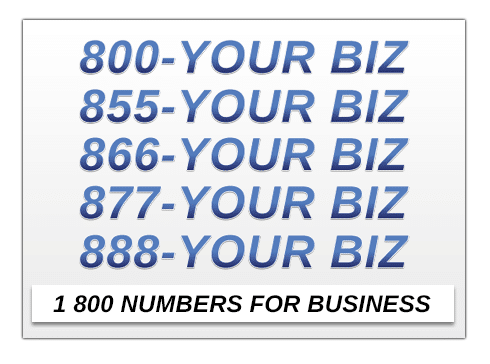 One of the most recent trends that is happening in the business world is that many companies and entrepreneurs are making the switch from a regular telephone number to a business 800 number. Businesses require these toll free numbers to help improve their operations and product/service quality. And that’s exactly what a Business toll free number does, especially one that includes small business phone service, such as a cutting-edge Virtual Auto Attendant Phone System (priced for startup companies). The main reason why this can be possible is located in the name of the service that is being provided, “TOLL FREE numbers”. A toll free number is one that begins with a three digit code such as 800, 855, 877, etc. These codes are very important for the customer as it enables the person that is calling to make contact without paying any money for the call. The cost of the call is borne by the entity that is being called, in this case, the business that purchases the toll free number. Business 800 numbers are important in allowing customers to make more calls to the business with regard to problems, support and even to make more purchases. This can greatly increase the sales of the business and it will definitely improve the quality of service that is being provided by the business. 1. A getting a virtual receptionist is an easy, inexpensive and professional way to set up a 24/7 answering service for your business. UniTel Voice offers toll free number service with a customizable auto attendant or virtual receptionist – that works as an easy, inexpensive and professional 24/7 answering service. 2. Live human answering services can get expensive – virtual receptionist can be more efficient and more cost effective. 3. UniTel Voice can help you set up your auto attendant and afterhours greetings so your customer experience is topnotch.